Picture yourself relaxing in the sun, surrounded by the beauty of your garden. Easy to put together, you'll receive all fixings and full instructions, so you can assemble it quickly and simply and start using your chair in no time at all! The Emily Chair, complete with arm rests, is a sturdy and solid piece of furniture. Perfect for relaxing in the summer sun, the chair is a great feature on its own or paired with the Emily Table. 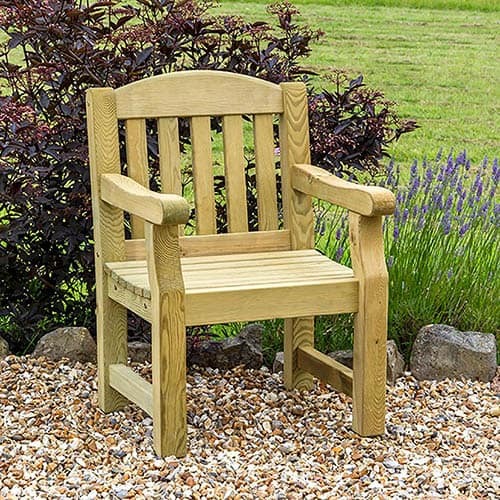 The Emily Chair is manufactured from high quality, pressure treated, FSC® Certified timber to last longer, and comes with 10-year guarantee against rot so you can be sure that this product will last and remain to be a beautiful feature in your garden. Dimensions: 0.64m x 0.65m x 0.95m, assembly required - This product is 2-person assembly.